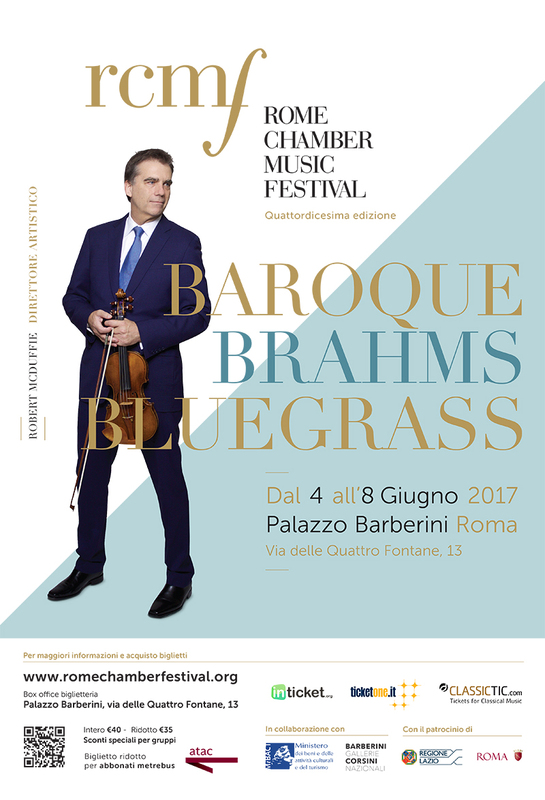 The Rome Chamber Music Festival celebrates its fourteenth season in 2017 with a sold out opening concert on June 4. Tickets are still available for the concerts from June 5 to June 8. In a few days the American violinist Robert McDuffie, founder and artistic director of the festival, will enrich with sublime melodies the extraordinary National Gallery of Antique Art in Palazzo Barberini, with a spectacular new program that includes classical and contemporary chamber music masterpieces, from Baroque to Bluegrass (from Brahms to Bruch and Beethoven, from Saint-Saëns to Vivaldi and more); there will be the chance to hear to great classical pieces and compositions that are only rarely performed in Italy, interpreted by internationally renowned musicians and composers. On the stage the 22 rising stars selected through the De Simone Young Artist Program. Dedicated to nurturing new talent, the Rome Chamber Music Festival invites each year a select number of promising music students from all other the world, with the precious aid of its gracious supporters, and gave the opportunity to perform with the best young musicians from the Robert McDuffie Center for Strings and alongside their famous teachers.